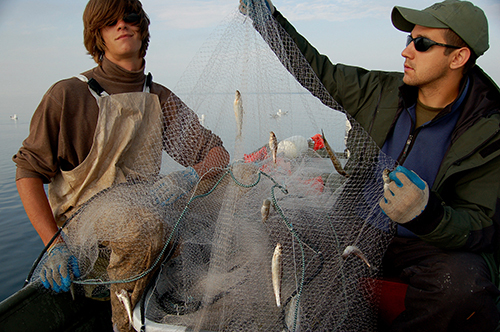 The Great Lakes Fishery Commission, in cooperation with other agencies, makes various databases available through the internet. At this time, not all databases are available. Cooperative fishery management requires access to common sets of information to assist in wise decision making. Some of those data sets are posted on this web site. A brief description of each database and how it is useful to Great Lakes fishery management can be found below. This database provides access to a centralized, comprehensive database of all fish stocked from artificial propagation into the Great Lakes. The database was developed through a peer review process that involved fishery professionals from every agency that stocks fish into the Great Lakes. Fishery managers use this database to help them understand the food and habitat needs of stocked predators in each lake. The database is updated, maintained, and hosted by the U.S. Fish and Wildlife Service. This database facilitates communication between people who tag and those who recapture lake sturgeon across the Great Lakes. The database provides the ability to determine who should be contacted when a tagged lake sturgeon is encountered. The database is updated, maintained, and hosted by the U.S. Fish and Wildlife Service. This database is not publicly available and is meant for fishery agencies to share stocking plans and associated tagging needs to properly evaluate whether stockings have achieved management objectives. The utility of this database has declined since the development of mass marking and the decline in numbers of fish stocked throughout the Great Lakes since 2005. This database is updated and hosted by the commission on behalf of the lake committees. This database provides descriptions of research conducted on chemicals that are used to control the parasitic sea lamprey (Petromyzon marinus) in the Great Lakes (3-trifluoromethyl-4-nitrophenol [TFM] and 2',5-dichloro-4'-nitrosalicylanilide [niclosamide]). 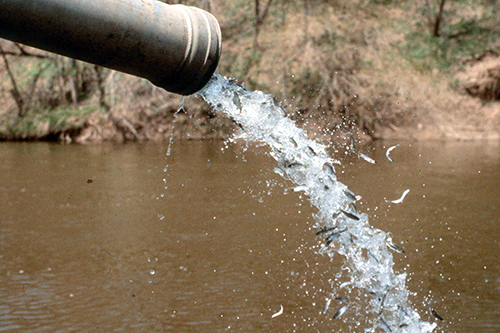 Data contained in this compendium are from studies on the toxic effects of lampricides on target and non-target organisms, and research on the environmental fate of TFM and niclosamide. This resource allows interested parties to search for specific information on the impacts of lampricides on a wide range of organisms including aquatic invertebrates, fish, plants, wildlife, and humans. Commercial fish catch data (called production) were published by the Great Lakes Fishery Commission in 1962 (Technical Report No.3) and covered the period 1867-1960. A supplement covering the years 1961-1968 was released in 1970, and a revised edition covering the years 1867-1977 was published in 1979. This third update of a web-based version covers the period 1867-2015. The intent is to update at approximately five-year intervals. The files are intended for open use by the public. We ask only that the commission be acknowledged when these records are used in presentations and publications. You can download data in Microsoft Excel Access format (Right click the link and save to local disk). Citation: Baldwin, N.A., Saalfeld, R.W., Dochoda, M.R., Buettner, H.J., Eshenroder, R.L., and O’Gorman, R. 2018. Commercial Fish Production in the Great Lakes 1867-2015 [online]. Available from http://www.glfc.org/great-lakes-databases.php [add date accessed].